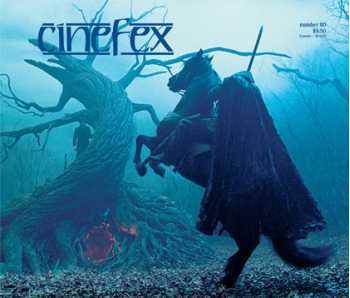 For his horrific, yet stylish Sleepy Hollow, director Tim Burton created a post-colonial New York village in England and assigned effects teams at Industrial Light & Magic, The Computer Film Company and Kevin Yagher Productions to supply a murderous headless horseman and a gruesome array of decapitation victims. With this issue, Cinefex is marking its twentieth year, an occasion that has prompted us to take a wholly subjective look back - to reflect on how Cinefex came to be, how the effects industry has evolved since the magazine's inception, and to recall some of the highlights of the last two decades. We asked a few of our friends in the business to help us celebrate our 20th anniversary by offering up their considered opinions as to the best effects sequences of the past 20 years. Also, in an unprecedented display of subjectivity, Cinefex editorial staff members picked their own personal favorites. Under director Rob Minkoff and senior effects supervisor John Dykstra, animators at Sony Pictures Imageworks created a photoreal, if fanciful, computer generated mouse for Stuart Little that effectively carried the movie, while artists at Rhythm & Hues and Centropolis Effects supplied lip-sync to a supporting cast of talking cats. In Fight Club, director David Fincher concocted subtle visual effects to get inside the twisted mind of his film's narrator. With oversight from visual effects supervisor Kevin Tod Haug, teams at Digital Domain, Pixel Liberation Front, BUF, Image Savant, Blue Sky, Command Post/Toybox and Gray Matter contributed to the effort. A one-on-one interview with stop-motion maestro Ray Harryhausen by Phil Tippett.